Perhaps 120 species, cosmopolitan, mostly in the temperate regions of the Northern Hemisphere. Some species are well-known garden plants (Anemone sylvestris L.). A. bucharica (Regel) Finet et Gagnep. Central Asia (Pamiro Alay). Rocky slopes in foothills. Rootstock tuberous. Flowering stem erect, pubescent in upper part, to 10 cm at beginning of flowering, elongating to 40 cm in fruit. Basal leaves dark green, 3-parted, segments bipartite or trisected almost to base. Flowers 8 to 10 per plant, solitary or in pairs, with 2 or 3 bracts, large, 4-6 cm diam., dark purple, red or orange-red. Stamens dark violet. V - in nature February to June. Fl - April (May in St. Petersburg cultivation). Fr - July (in St. Petersburg). P - by seed sown immediately or by division. Does well in dry, warm places. Suffers from excessive moisture in autumn. Good for the rock garden. Z 5 (4). New. A. kuznetzowii Woronow ex Grossh. Caucasus (southern Transcaucasus). Among shrubs, in open woodlands. Rootstock tuberous. Stems 10-20 cm when flowering and 40 cm in fruiting period. Basal leaves long-petiolate, bipinnate, these segments trisected to mid-point. Bracts widely rhombic in outline, divided into three parts, these segments bipartite or narroowly trisect. Flowers solitary, rarely in pairs, 3.5 to 5.5 cm diam., bright red, with dark spots at base. V - early spring to mid autumn. Fl - April in the wild, end of May in Tbilisi. Fr - June. P - by seed and tuber division. Slightly shade tolerant. Requires well-drained soil. Very attractive. Good for group planting. Z 6 (5). New. Central Asia (Pamiro Alay). In sunny open forest, among shrubs, on steppe slopes in the mountains, up to 3,000 m.
Rootstock tuberous. Stem elongating from 5 cm to 35 cm with fruits. Basal leaves 1 or 2, long-petiolate, 3-parted, segments shortly trilobate. Bracts 3-parted. Flowers solitary, 3.5-4.5 cm diam., light violet, pink with white tinge. Stamens violet, numerous. V - in nature February to June (April to July in St. Petersburg, where suffers from excessive moisture in autumn). Fl - April. Fr - June. P - by seed or division. Well suited for the rock garden. Z 5-4. New. 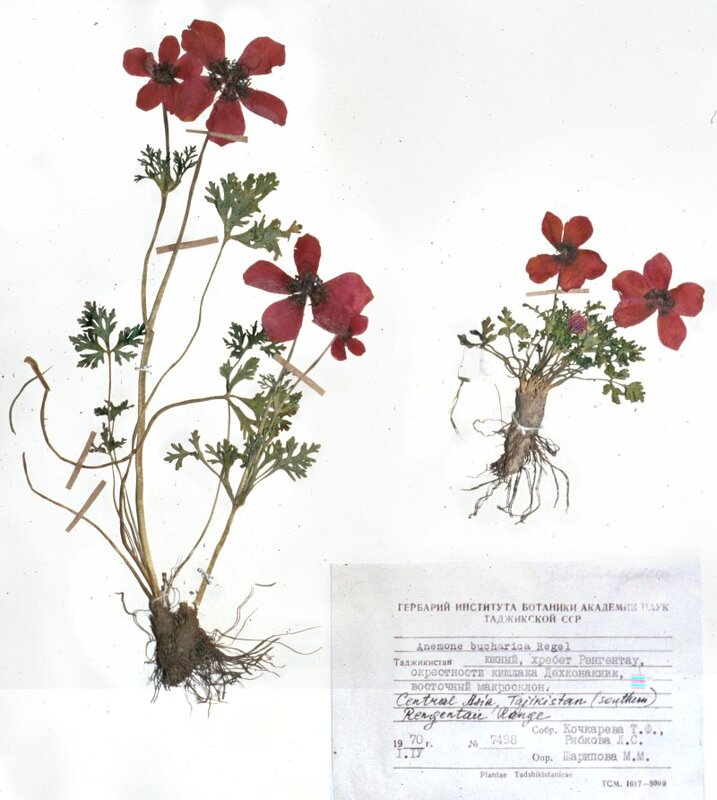 The following Central Asian species of Anemone are also of garden interest. Tuberous roots. Stem ca. 25 cm. Leaves 3-parted. Flowers yellow. Z 4. New. Similar to A. bucharica, differs in flower size and colour (smaller and yellow). Z 4. New. Tuberous roots. Stem ca. 25 cm. Leaves 3-parted, deeply incised. Flowers 4 cm diam., yellow. Z 5 (4). New.